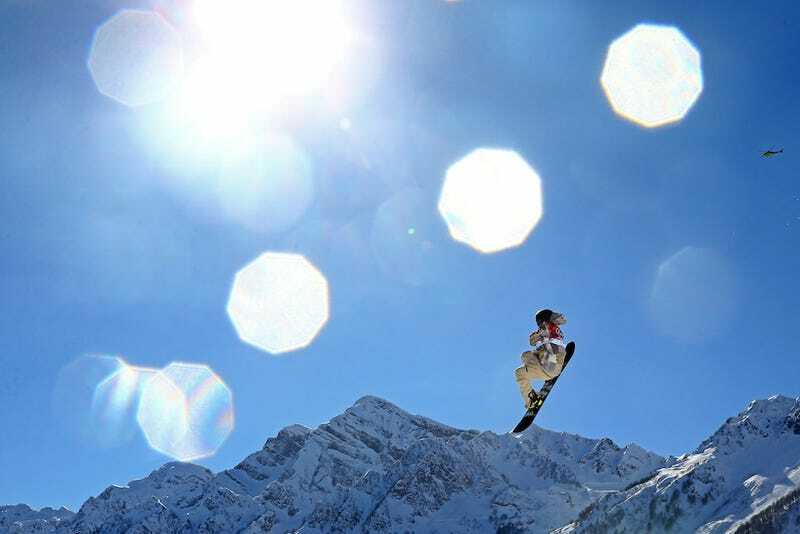 Sage Kotsenburg won America its first gold today in Snowboard Men's Slopestyle and, as you might imagine, a human flying through the air in front of snowcapped mountains is wonderful eye candy. This was the event and course that many in the sport felt was unnecessarily dangerous, prompting snowboarding's biggest star, American Shaun White, to pull out of the event altogether earlier this week. Despite all that, Kotsenburg won with a trick he had never tried before. He called his brother and coach before the finals to discuss it. He wanted to throw a trick called "Back 16 Japan" on his first run in the Olympic finals, never mind that he hadn't tried the move in practice or prior competition. No one talked him out of it. "I ended up landing it, and winning with it," Kotsenburg said, laughing. The trick is four and a half backwards spins (1620 degrees of rotation), while grabbing the backside of his board (Japan).